Lesner Bridge spans Lynnhaven inlet off of Chesapeake Bay in Virginia Beach, Virginia. The bridge connects the bay area to the shore of Virginia Beach. Plans to replace the bridge raised concerns over potential scour depths at the bridge piers. A two-dimensional model was requested to better examine the unique processes at the project site. Aquaveo assisted in the development of the two-dimensional model using TUFLOW. 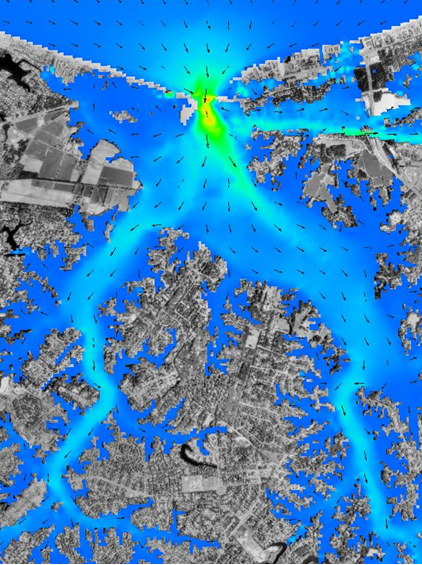 The model incorporated surface flows and tidal effects to predict flowrates, water detphs, and velocities. These values were then used to compute scour depths at the piers for the proposed bridge. 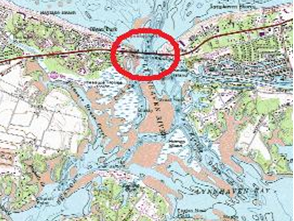 Results from the model indicated that the highest scour potential occurred on the bay side of the piers due to high velocities generated during the rising tide. 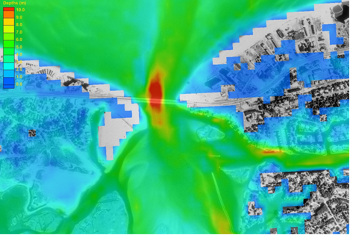 This information ultimately led to a better bridge design to protect against this risk.